Mark Warren Stubbins, 60, passed away at home on the morning of August 8, 2018, surrounded by his wife, Kay, and four children, Grant, Kara, Amanda, and Blake. Mark was born in Zanesville, Ohio on November 13, 1957, to James Burnside Stubbins and Ann Allan Stubbins. He grew up on Taylor Street and attended Zanesville High School where he graduated in 1976. He went to college at Miami University (Ohio), where he majored in finance and graduated in 1980. While working a summer job breaking down boxes at Brockway Glass in Zanesville, he met his bride Kay. After five years of dating and some not-so-subtle threats from Kay, the two wed on March 31, 1984. Their happy marriage has lasted 34 years. Following college, Mark attended the University of Cincinnati School of Law. 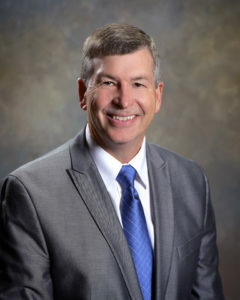 He graduated with his Juris Doctor in 1983, and then moved back to Zanesville to begin his legal practice with his father, James, and brother, Brent. Mark’s legal career spanned 35 years and was focused in the areas of civil litigation, criminal defense, and oil and gas litigation. He was proud and honored to practice alongside his father, brother, and son, as well as his good friends and colleagues, Mark, Mike, and Kyle, with the firm Stubbins, Watson, Bryan & Witucky. Mark was the rock of the family. He loved planning and going on exotic vacations with his wife and children. Some of his favorite memories included family trips to South Africa for safari; Alaska for glacier rappelling; Iceland for waterfalls and hiking; Italy for ancient ruins; Southern France for wine tasting; and cruises to the South Pacific and Australia. Mark also enjoyed golfing at the Zanesville Country Club, baking homemade bread, making gourmet chocolate cakes, learning about history, internet shopping for his wife and children, and taking jokes one step too far. Over the course of his life, Mark was involved a wide range of community organizations, including Central Trinity United Methodist Church, Zanesville Daybreak Rotary, and the Muskingum County Bar Association. In addition to his wife and children, Mark is survived by his mother-in-law Louise (Jim) Jones; brother Brent (Susan) Stubbins; sister-in-law Diane Jones; brothers-in-law Wayne (Glenda) Jones and Max (Debbie) Jones; nieces and nephews Melissa (Joel) Kuhlman, Abby (Steve) Gartland, Megan (Dave) Mortimer, Lindsey Jones, Elizabeth (Eric) Stubbins, and James Stubbins. He is preceded in death by his parents Jim and Ann Stubbins. Calling hours will be held on Saturday, August 11th, from 4-7 p.m. at Bryan & Hardwick Funeral Home, 2318 Maple Avenue, Zanesville, Ohio, to be followed immediately by the funeral service. In lieu of flowers, donations can be made to Central Trinity United Methodist Church or Zanesville Daybreak Rotary. To share memories and condolences with Mark’s family please visit www.BryanHardwickFH.com.